MEET KEIRSTAN - SHE IS BEAUTIFUL, SMART AND HAS AUTOIMMUNE ISSUES! Stories about MS, Hooping, Food and Health! Hi, My name is Amy Raspiller. This blog is about my community and my many circles of life; MS, Food, Hooping and Health! This blog started because my health journey brought me to this point of sharing information. So many people before me have shared much needed information with me, through the internet, that I feel compelled to give back in some way. Perhaps someone, who is surfing the web, needs to hear what I am sharing here. The intent is to share stories of hope and inspiration, to share information, and to encourage people. My hope is someone, somewhere will land here on my website and not feel alone. 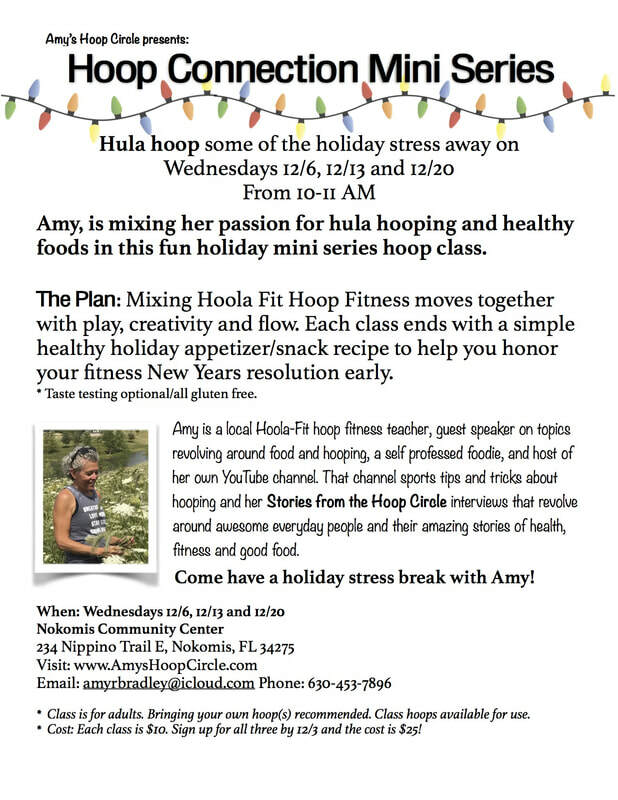 ​Here, I am sharing personal experiences about hooping with people, about MS, and about food - glorious, healing food! Check out my HOOG page for the detail. But in short - I challenge you to get moving, Check out how all this got started with my new friend Patrick Coffey! And with Mr. Show Up, my buddy Tony Ferro! Note here - I am coming with various hoops both weighted and unweighted. The weighted hoops, are just ONE weight. The weighted hoop slows the hoop down a bit. I will have unweighted hoops too. One of the most important aspects of hooping as an adult is to have the right size hoop for YOU! I got hoops and I am bringing them with me. 2 dates to join us. I am so excited to be returning to Metamorphosis - Such a beautiful place to just say Ahhhh and be YOU! Register at www.metamorphosis-pilates.com under Class Schedule then Enrollments Tab. LAKESIDE FITNESS - I love you! Hoopers you are super duper hoopers! Looking forward to being back in Syracuse in 2019! APril mini classes - going strong! Listen in on this video about how with my mini classes - you can DESIGN YOUR HOOPING TUESDAY! Still Happening - Just drop in and try it out! ​MARCH MADNESS - More Mini classes happening - Amy's Hoop Circle is growing! ANNOUNCEMENT: Hooping Connections and Music, is the running theme for one class being offered this June at the Fruitville Public Library. Super excited to be adding classes to my summer kick off. ANNOUNCEMENT: Hoop Connections and Music, is the running theme for three one day only classes that I am doing with the Jacaranda Public Library in June as part of their summer programming. These classes are for children of all ages and they will be published on the library's schedule of events. I am excited about kicking off my summer hooping for 2018 with children in my local community! Currently running and you can drop in! FEBRUARY CLASSES - SO darn fun - you forget it's good for you! THIS SESSION IS OVER - iT was outstanding Each week is new... come check it out! High energy hooping constantly, laughing with friends and sweating it out... this was a fast half hour. What a great way to bring up your energy in the middle of the day! Yesterday we worked on the HIP REEL a nifty move that will twist your brain a little until you get the hand move figured out. Our awesome group... was all over it. We started with a Yo Yo move --- fun, loose and playful. Then we added BREAKS to ELBOW ARM HOOPING and finally we did a nifty move called a K-ROLL. We challenged our brains (Hooping is like a puzzle sometimes), learned new moves, listened to awesome music and brought our afternoon up in energy. We added to that, a healthy green smoothie called an, Apple Pie smoothie. Green yes, but sweet and tasty! Starting Tuesday, January 16th. READ FOR MORE INFORMATION! HOOPING IS COOL! Really cool. ​YES PEEPS I am having class tomorrow morning at the Venetian POOLSIDE and I hope the weather is cooperative. If it is windy - I will show up and assess the day at 8:30 am. If it is raining - I will be at home watching it come down. If it is toooooo cold - I will post a note here and ask you to share with your friends who don't do FaceBook. This Mini Series is currently on-going and started this past Wed., 12/6. It was pretty awesome - if I do say so myself! This series focus is workshop like in nature, pulling skills from attending hoopers, adding transitions and mixing in some creative play. Why - because we all deserve to be a kid again and for those of us who love hooping - this is an opportunity to find some flow with those nifty tricks we've learned in our hoop fitness class. So if you missed the first week - you can still join us for weeks 2 and 3. Come on out and destress as the holidays progress! 12/13 - This week. New moves to integrate into your hoop dance - in our quest to find flow. Vortex Breaks, Orbit Breaks and Vortex variations. Looking forward to it! This site is a work in progress. Here I am pulling together my YouTube Channel, Tumblr blogging and from my YouTube channel I am highlighting the interviews I do with every day people about health and hooping. YouTube Channel: Restorative Hooping with Crazy Amy. Hooping information. Tumblr: My Autoimmune Awakening, A blog is about my autoimmune journey, my recovery, food (Real Healthy Food) and HOPE! Stories from the Hoop Circle are a subset of my YouTube Channel.